Summer's inevitable end is a bleak time for most people. Tree leaves fall, days get shorter, temperature drops. As students in high schools all over get ready for the first part of what's destined to be another long year, a select minority of people are gearing up for what they know is truly the most exciting time of the year: Cross Country season. The XC participants in the Washington Catholic Athletic Conference (WCAC) are no exception. The schools in this twelve-team private school conference are once again readying themselves for a long road of cross country, renewing old rivalries amongst themselves, creating new ones, and preparing for what is bound to be an epic Championship meet on the notorious Lake Fairfax, Virginia course in late October. On the guys' side, the strongest team in the WCAC appears to be Our Lady of Good Counsel, in Olney, Maryland. After winning its last WCAC Championship in 2003, GC boys have lain low for a few years but look to shine in 2007. With WCAC 3200 meter champion Ian McDermott at the helm of the squad, and after losing only one senior from last year's XC Championship, GC is in a very good position to do well this fall. GC returns, among others, seniors Drew Collins and Chris Hogan, juniors Sam Rainard and David Sullivan, and sophomore Kyle Graves. After a very strong 2nd place showing at Woodward Relays last Tuesday, and an equally strong 3rd place showing at the Peter Geraghty Invitational, GC is certainly poised for success. The other favorite appears to be DeMatha Catholic, located in Hyattsville, Maryland. Usually known for its perennially strong football and basketball teams, the cross country team has gained recognition in recent years, and last year beat Gonzaga to the WCAC crown in a thrilling 35-41 outcome. 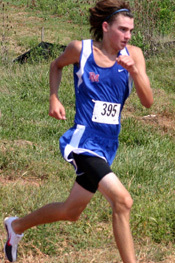 Led by last year's champion Robert Patterson (pictured above), and second place finisher Cory Puffett, DeMatha's squad looks to be even stronger, as they are joined by 4:30 miler Brian Benkhadra, and 1:57 800 runners Chad Rogers and Lloyd Foster. Though the rest of varsity is still being figured out, DeMatha still looks to have a solid squad, and placed 4th at the Peter Geraghty Invitational, 16 points behind Good Counsel. A squad that lost many of its previous members to graduation is Gonzaga College High School, located in Washington, D.C. Having graduated its best harriers to Fordham (Tom Kelly) and Pittsburgh (Aaron Taylor), this team characterized by its size and by its purple jerseys appears to have reloaded once again, thanks to the efforts of new head coach John Ausema. While the varsity 7 on Gonzaga is not yet set in stone, numerous talented J.V. runners populate the team's ranks, and things could easily change. However, for the time being, varsity members include sophomore Will Fleury, as well as seniors Ted Lopez and Tom Hill, and juniors Billy Lewis, Mike Kerrigan, and Devin Kelly. Gonzaga has an even tighter pack than last year, and ran very well the Spiked Shoe Invitational led by Fleury. The other teams competing in the WCAC on the guys' side are Bishop O'Connell (Arlington, VA), Paul VI (Fairfax, VA), Bishop Ireton (Alexandria, VA), Bishop McNamara (Forestville, MD), St. John's College (Washington, D.C.), and Saint Mary's Ryken (Leonardtown, MD). Of these teams, O'Connell and Paul VI appear to be strongest, with numerous J.V. runners rising through the ranks to become notable varsity runners last year. O'Connell was led for most of the season by rising junior Dan Welch, who had an impressive 17:03 5K P.R. at Glory Days Grill Invitational. Welch will likely lead O'Connell again, joined by teammates Alex Ocampo, Richard Gonzalez, Matt Gardner, Andrew Stella, and Patrick Donnelly. Paul VI looks to be strong as well, and looks to leadership in the form of Charles Horne, who came on strong as a sophomore with a 16:56 P.R. and an 8th place finish at WCAC Championships last year. Horne will be joined by junior and low-4:40 miler Ian McGinn, senior Eddie Wojtan, Andrew Reilly, JW Stohlman, Dominick Casciano, and Grant Higginbotham. Paul VI finished 12th out of 22 teams at the Peter Geraghty Invite, ahead of conference foes St. John's and Bishop McNamara. Bishop Ireton looks to be much stronger than last year, after losing only one senior. Ireton will be led by senior veteran Kevin Rivero, fellow seniors Joey Chelak, Drew Walter, and Stephen Vaccaro, as well as juniors Kevin Gotleib, Dan Palmer, and Colin Barkell, who hope to bring Ireton back to the top of the WCAC and to the top of the VA Catholic School and VIS State Championships. McNamara will led by junior Kenny Hunt, SMR will be led by Joe Valenzuela, and St. John's will be led by sophomore Carl Waclowick. On the girls' side of the WCAC, the past several years have been marked by a power struggle as the three perpetually strong girls' teams, O'Connell, Paul VI, and Good Counsel, have each won a conference title. One thing has been consistent, however: three-time champion Nora McCall. With her recent graduation to Colby College, the top of the WCAC is anyone's game, and this year looks to be as exciting as any. Right now, the strongest team appears to be Bishop O'Connell, who placed second as a team in last year's championships. Though their last team title was in 2004, they return their entire varsity, led by the dominant 1-2 punch of Megan Fitzpatrick and Katie Walls, who placed 2nd and 4th respectively at last year's Virginia Independent Schools Division I Championships. Fitzpatrick in particular looks to take the individual title, and will be joined on the varsity squad by teammates Michelle Van Horn, Madeline Giaquinto, Stephanie O'Neill, Lucy Tamberrino, and Archbishop Carroll transfer Gloria Roberts. O'Connell looks like the team to beat especially after their 7th place showing against various national and state powerhouses at Great Meadows Invitational. One team hit hard by graduation is Good Counsel, who lost leader Nora McCall, as well as 5 other members of last year's 12-woman lineup. However, they return last year's WCAC runner-up and rising senior Stephanie Bardon, and sophomore Beth Conlon, both of whom earned All-Region Honors for their efforts through the season. While the rest of their varsity is still being figured out, GC had a strong showing at Woodward Relays, as Bardon and Conlon were joined by junior Kara Riely and sophomore Katie Koenig, as well as newcomers Katie McCartin and Caitie Collins. In almost the same boat as GC is Paul VI, who also lost a very talented core of seniors from last year's team, which beat O'Connell to the 2006 VIS Division I state title. Though they graduated their top 3, and 5 of their top 7, they return several talented runners from last year in Mackenzie Singh, Lizzie Greene, and Kate Still, and are joined on varsity by Meghen Grant, Christina Kling, Kristin Grady, and Grace Higginbotham. Paul VI finished 10th at this year's Peter Geraghty Invitational, 2 spots and 67 points behind Good Counsel. Another school worth mentioning is Archbishop Carroll, located in Washington, D.C. by Catholic University. Despite not having any runners on the guys' side, and an incomplete team on the girls' side, several top runners compete each year for Carroll, including junior Ashley Seymour, who competes for the recognized Mach Los Track Club, and soared to personal bests of 2:15 and 5:10 in the 800 and 1600. She will be joined by and Brianna Adams. Julianne Tela is another formidable runner, who led Bishop Ireton's team in 2005 with a second-place finish to McCall, and who paced Ireton to a 4th place finish as a team in last year's championships. She hopes guide Ireton's team to strong placings at WCACs, VA Catholic School and Independent School State Championships. Also on Ireton's varsity are seniors Natalie Stier, Michelle Hopke, and Ali Fracasso, as well as junior Emily Conron and sophomore Renee Von Guggenberg. Other teams in the WCAC include Academy of the Holy Cross (Kensington, Maryland) who returns Grace McCann, Caitlin Parker and Anna Davitt; Bishop McNamara, who placed 17th in a field of 17 teams at Peter Geraghty Invitational; St. John's, which had an incomplete team last year, and finally, St. Mary's Ryken, which placed 5th in last year's 8-team field led by runner Lauren Finknauer.